Starting a small business is a lot of hard work. You need a great idea, bucket loads of passion, good credit sources, and a strong will to succeed. Typically for a small business, you will be multitasking, taking care of management duties, product development, marketing, customer service and technical support, and so on. Small business success will depend on your abilities to balance these different roles in the early stages of your small business startup. Some of these tasks cannot be delegated to others, either due to limited resources, or the need for you to be heavily involved in the early developmental stages of the business. So, in the areas that you can get assistance, it makes sense to do so. Business communication is one of those areas where help is at hand. Business writing might seem like a small concern at first, but it is at the heart of presenting a good company image, and can be instrumental to your success. The WhiteSmoke writing tool can help make your business communications a breeze. Write what you need to write, and save valuable time and money by letting WhiteSmoke be your personal editor! Your business e-mails, presentations, customer service, and product announcements will be free of English grammar and spelling errors. The benefits of an English writing tool do not stop at grammar and spelling. 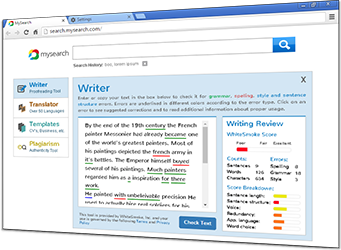 WhiteSmoke has a unique, and patented, text enrichment feature which actually enhances what you write. Here's how it works. When you send a text to WhiteSmoke for proofreading, WhiteSmoke offers "enrichment" suggestions as well as grammar and spelling corrections. Enrichment includes replacing some words with synonyms, or adding adverbs and adjectives to make a sentence more persuasive and better to read. 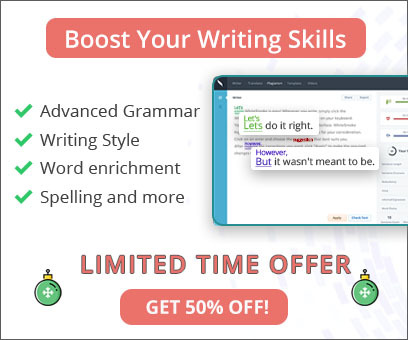 An all-in-one writing tool would not be complete without a proprietary dictionary and thesaurus give you access to any word you need, and over 600 letter templates can help you get started on just about any letter you need to write. With all these features in a well-designed user interface, WhiteSmoke provides an efficient and accurate writing solution for your small business. Apart from all the benefits WhiteSmoke will bring to your business communications, don't forget that it will also free up more time to concentrate on developing your business in other ways. WhiteSmoke is the perfect companion for every small business startup.